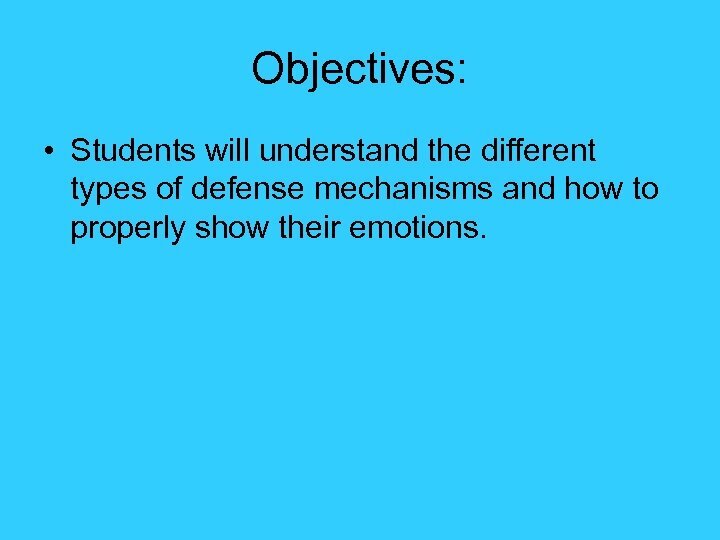 Objectives: • Students will understand the different types of defense mechanisms and how to properly show their emotions. 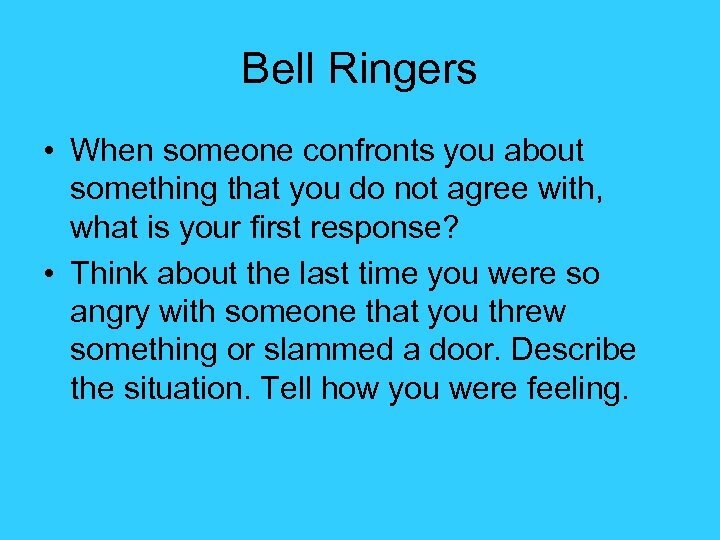 Bell Ringers • When someone confronts you about something that you do not agree with, what is your first response? • Think about the last time you were so angry with someone that you threw something or slammed a door. Describe the situation. Tell how you were feeling. 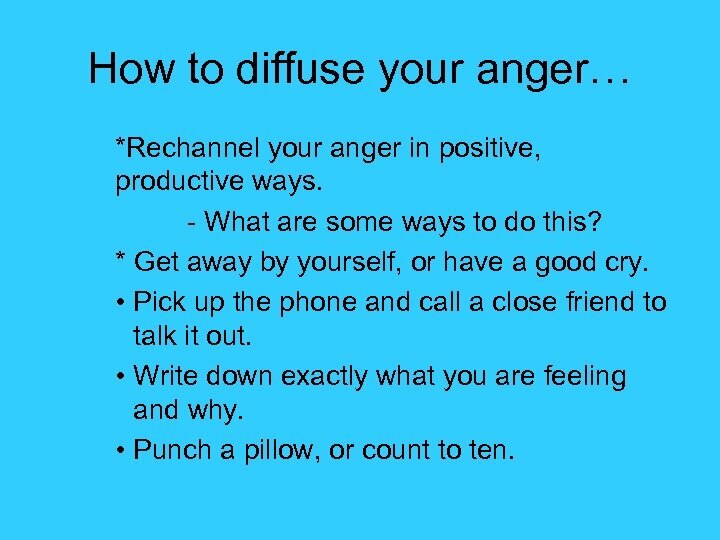 How to diffuse your anger… *Rechannel your anger in positive, productive ways. - What are some ways to do this? * Get away by yourself, or have a good cry. • Pick up the phone and call a close friend to talk it out. • Write down exactly what you are feeling and why. • Punch a pillow, or count to ten. 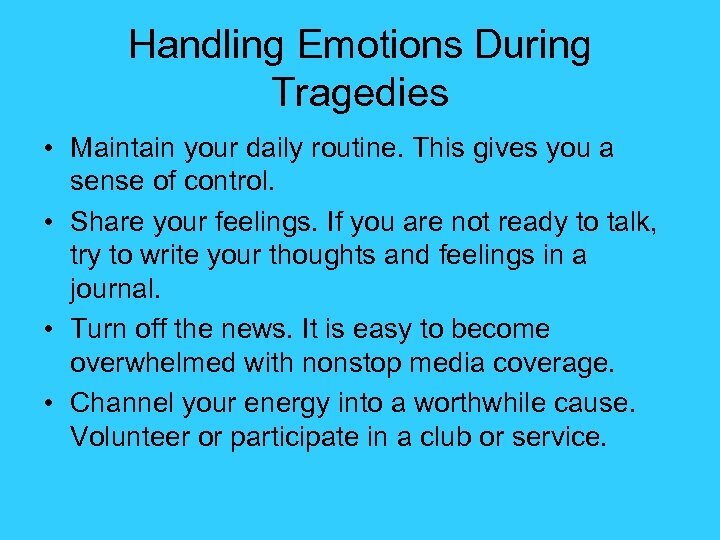 Handling Emotions During Tragedies • Maintain your daily routine. 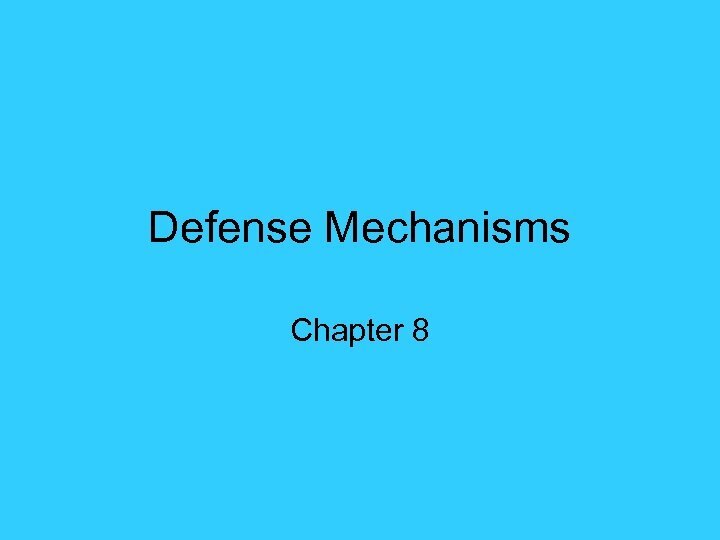 This gives you a sense of control. • Share your feelings. If you are not ready to talk, try to write your thoughts and feelings in a journal. • Turn off the news. It is easy to become overwhelmed with nonstop media coverage. • Channel your energy into a worthwhile cause. Volunteer or participate in a club or service. 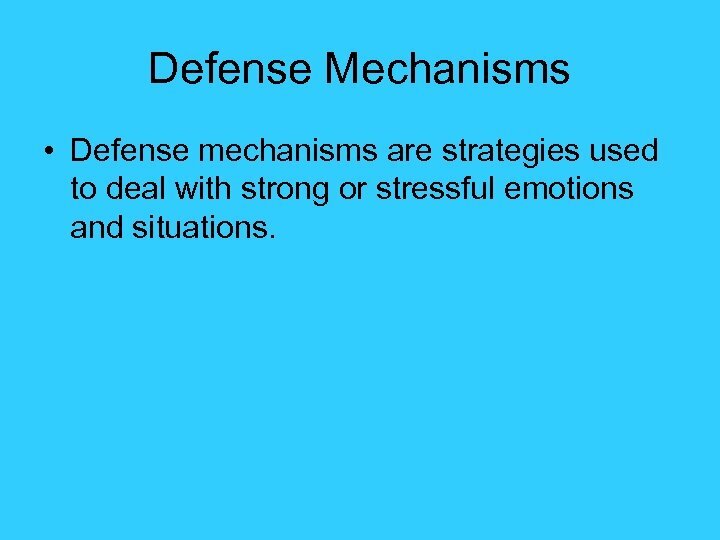 Defense Mechanisms • Defense mechanisms are strategies used to deal with strong or stressful emotions and situations. Resilience • The ability to adapt effectively and recover from disappointment, difficulty, or crisis. 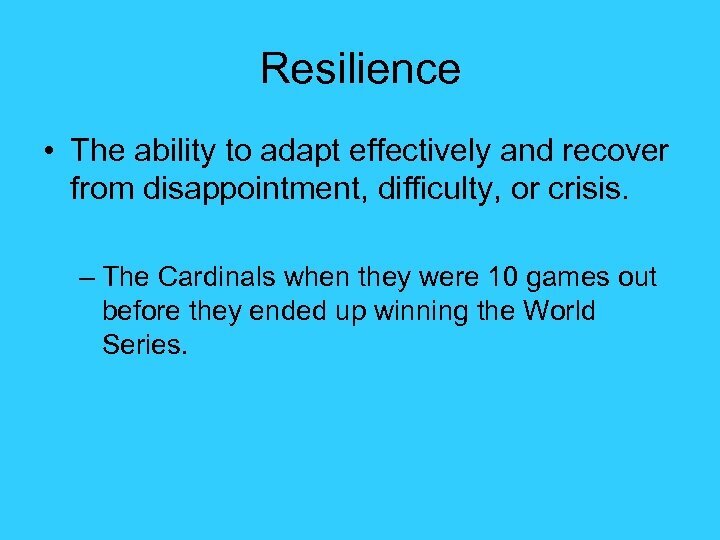 – The Cardinals when they were 10 games out before they ended up winning the World Series. 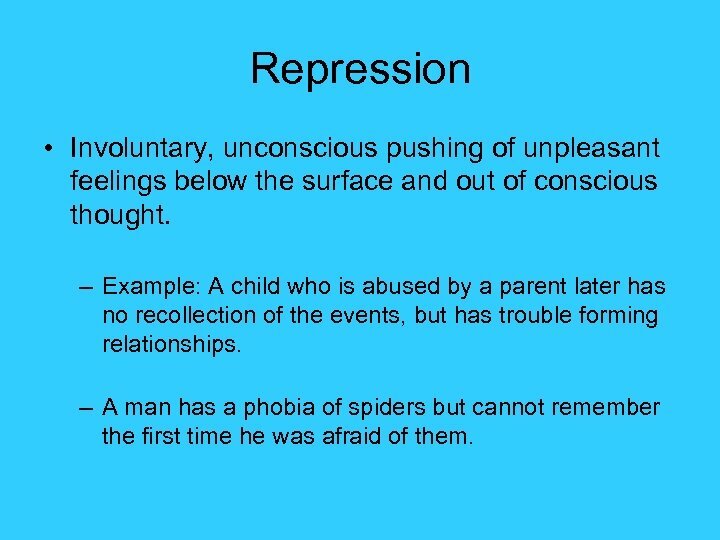 Repression • Involuntary, unconscious pushing of unpleasant feelings below the surface and out of conscious thought. 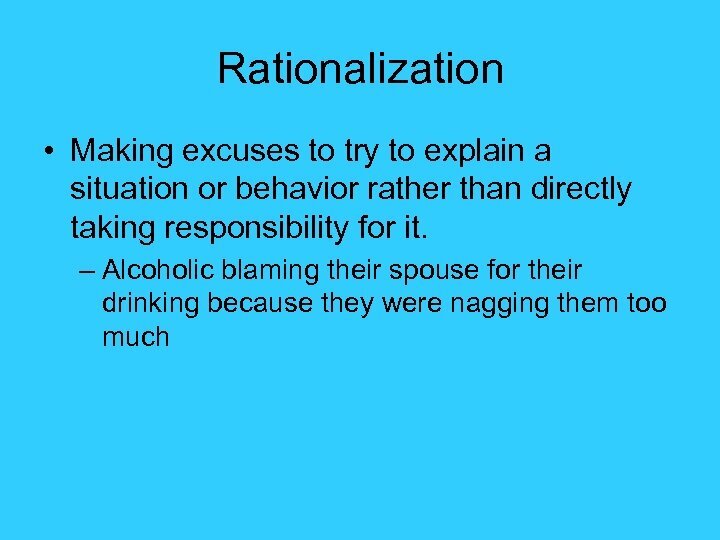 – Example: A child who is abused by a parent later has no recollection of the events, but has trouble forming relationships. – A man has a phobia of spiders but cannot remember the first time he was afraid of them. 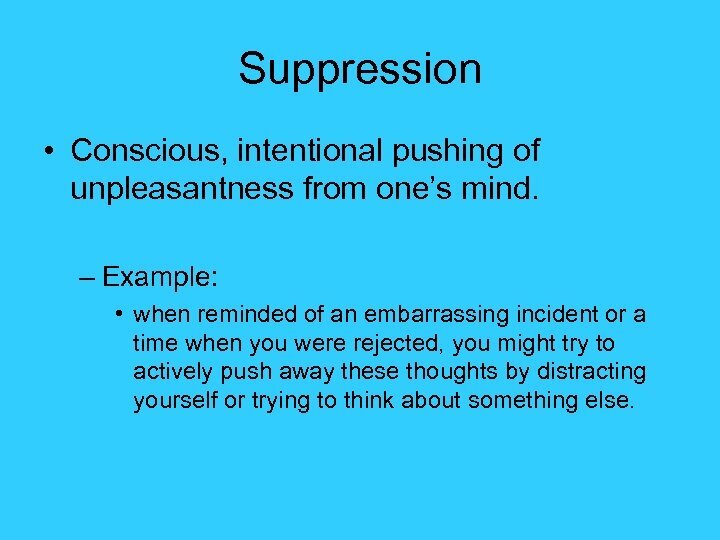 Suppression • Conscious, intentional pushing of unpleasantness from one’s mind. 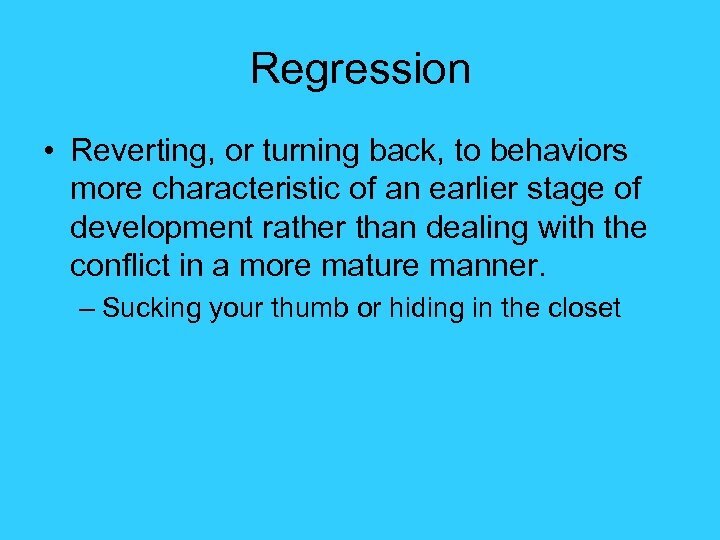 – Example: • when reminded of an embarrassing incident or a time when you were rejected, you might try to actively push away these thoughts by distracting yourself or trying to think about something else. 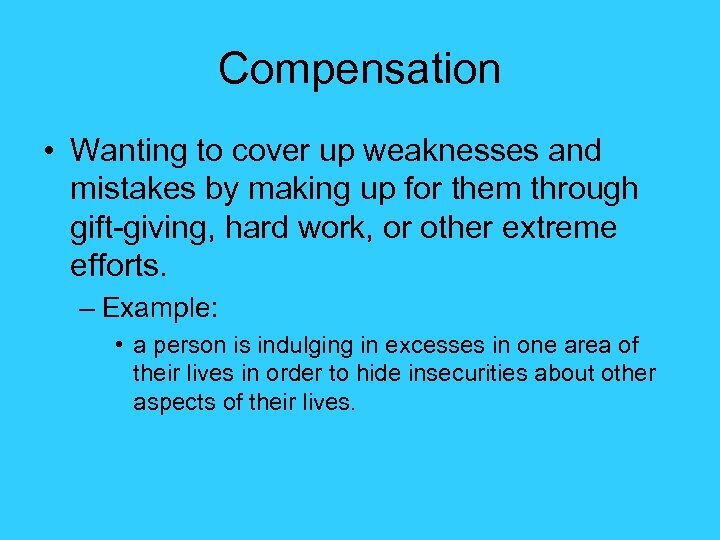 Compensation • Wanting to cover up weaknesses and mistakes by making up for them through gift-giving, hard work, or other extreme efforts. – Example: • a person is indulging in excesses in one area of their lives in order to hide insecurities about other aspects of their lives. 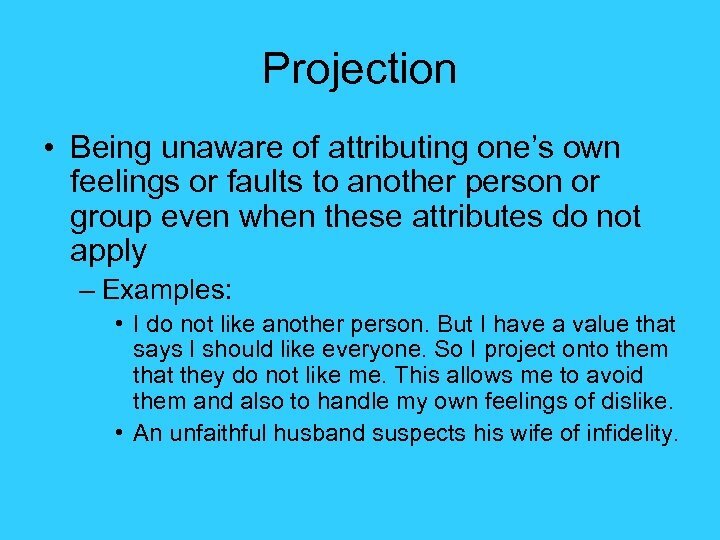 Projection • Being unaware of attributing one’s own feelings or faults to another person or group even when these attributes do not apply – Examples: • I do not like another person. But I have a value that says I should like everyone. So I project onto them that they do not like me. 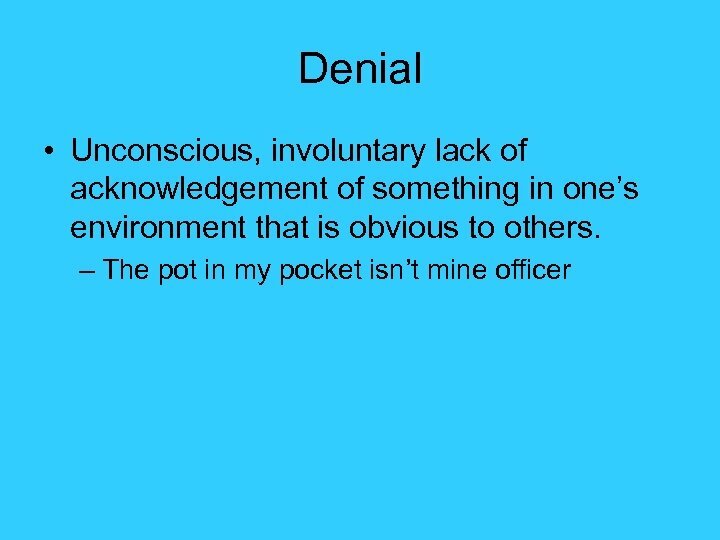 This allows me to avoid them and also to handle my own feelings of dislike. • An unfaithful husband suspects his wife of infidelity. 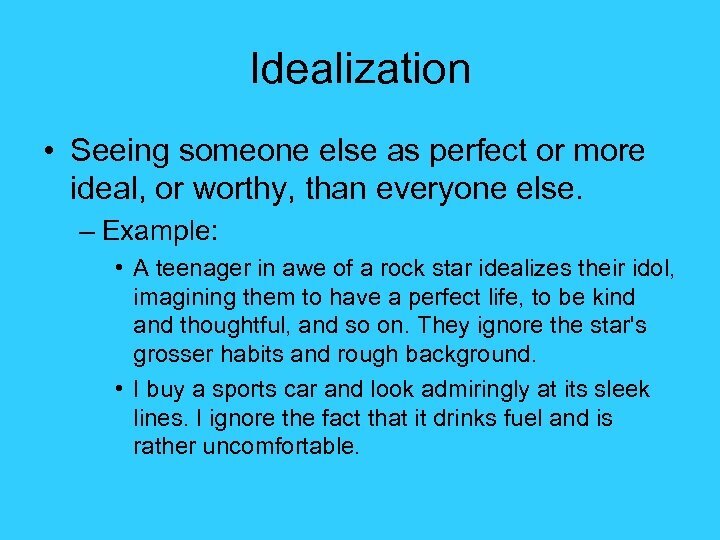 Idealization • Seeing someone else as perfect or more ideal, or worthy, than everyone else. – Example: • A teenager in awe of a rock star idealizes their idol, imagining them to have a perfect life, to be kind and thoughtful, and so on. They ignore the star's grosser habits and rough background. • I buy a sports car and look admiringly at its sleek lines. I ignore the fact that it drinks fuel and is rather uncomfortable.